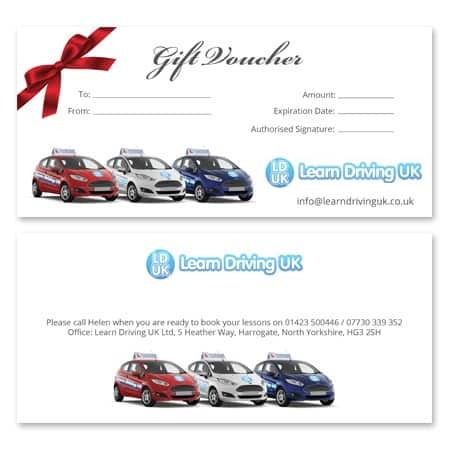 Buying a block of driving lessons as a gift voucher couldn’t be simpler from Learn Driving UK. Learning to drive is a new and exciting challenge and an important life skill we all need to achieve. Helping to fund the cost of a course of driving lessons would be a thoughtful and welcome gift for any learner driver. Whether it’s at Christmas, for a birthday or just because you care, a driving lesson gift voucher makes an excellent present which is bound to be appreciated. Simply choose the gift voucher value you would like from the dropdown options, or choose your own amount by selecting the “manual amount” option from the dropdown and entering the value gift voucher you would like. Your voucher will be dispatched first class and will arrive before your special event. Our gift vouchers are only valid for 3 MONTHS. (This means that you must have started your driving lessons within the 3-month period, but not necessarily finished them). If you would like any more information on purchasing a gift voucher, please call Helen on 01423 398012. Please always check that we cover your postcode area before buying your gift voucher. Gift vouchers are non refundable and can not be exchanged for cash under any circumstances.